1. Select users for the TS-Resource role. 2. Assign the TS-Resource role. 3. Select the users for ‘TS-Resource Manager’ and assign them the role. 4. Follow the same instructions starting from step 1 and assign ‘TS-Resource Manager’ role to selected users for ‘Add New Project’ process. STEP 2: Add or Modify Projects using the ‘Add New Project’ process. This process is used to add or modify Projects which are visible to users using Submit Time Sheet Process. 2. Fill in the given fields with appropriate values. 3. Check mark Departments which will be working on this project and enter ‘Hours per Department’ in the given field. Note: If department checklist is empty then user can request the Admin to insert Departments using the ‘Checklist and dropdown’ tile. 4. User can add multiple ‘Activities’ in their project by clicking the button and selecting ‘Add New TS_Activity’ from the pop out menu. Note: If Activity drop down is empty then user can request the Admin to insert Activity using the ‘Checklist and dropdown’ tile. 5. Click ‘Finish’ button to save the changes. 1. 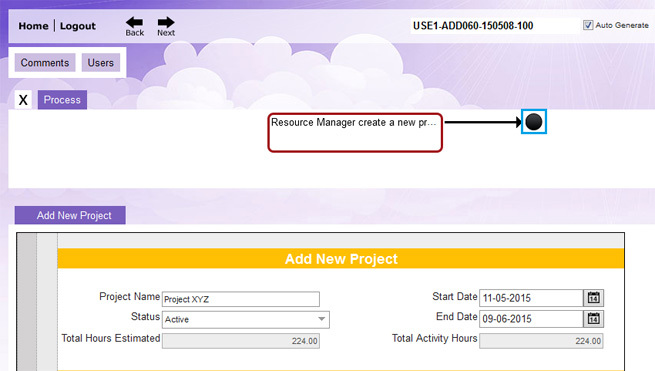 A user who is ‘EC_Resource’ can log in and raise a expense claim request by selecting the process from process inbox tile and clicking the ‘Start new’ button. 2. Start by filling out the form. User can add multiple ‘Activities Performed’ in their Time Sheet by clicking the button and selecting ‘Add New TS_WorkItem’ from the pop out menu. 3. Fill in the work ‘Item’. 4. Once the Time Sheet form is complete, send the process forward to ‘TS-Resource Manager’ by clicking the ‘Resource Manager Approval’ button. 1. 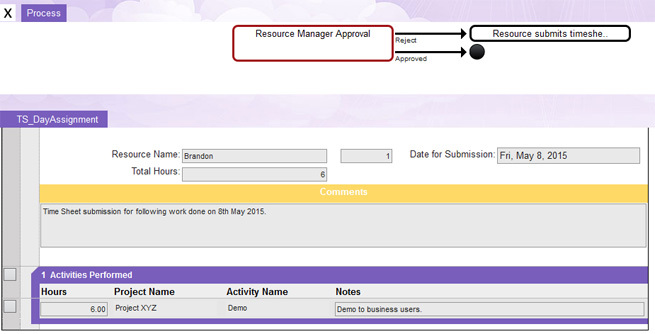 A user who has the ‘TS-Resource Manager’ role can log in and approve the request forwarded to them. To open the process, go to ‘Process inbox’ tile. Select the process and click the ‘Open’ button. 2. TS-Resource Manager will review the Time Sheet request. If there is no objection then the TS-Resource Manager will finish the process by clicking the ‘finish’ button. TS-Resource Manager can also send the process back to ‘TS-Resource’ in case of any discrepancy. After inserting the comments send the process back to ‘TS_Resource’. 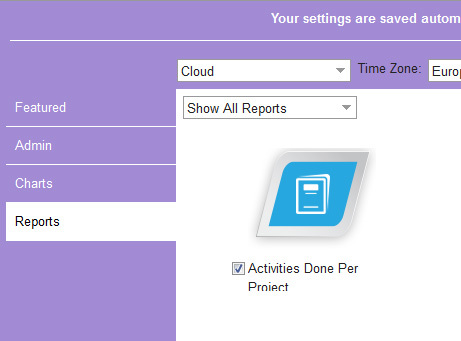 1.Select the ‘Activity done per project report’ from the Settings window (Reports tab). 2. The report appears and shows activities done per projects.